▪ •A very nice villa on the ocean with great view in a fully secure residential community. 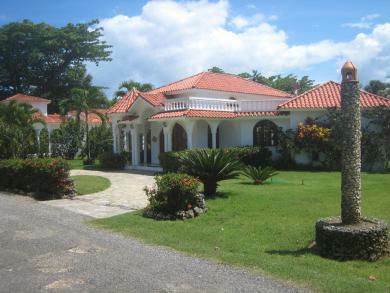 •Very quiet yet close enough to town that a short drive puts you in Cabarete or Sosua. ▪ •Excellent onsite restraunt. •Great pool with walkout access from both bedrooms and the living area. •Circular drive. ▪ •Mahogany walkin closets, air conditioning, ceiling fans, etc. This place is meant for living. •For a package deal of this villa with an adjoining lot see HG6058AB. ▪ •For the adjoining lot see BL6027AB.